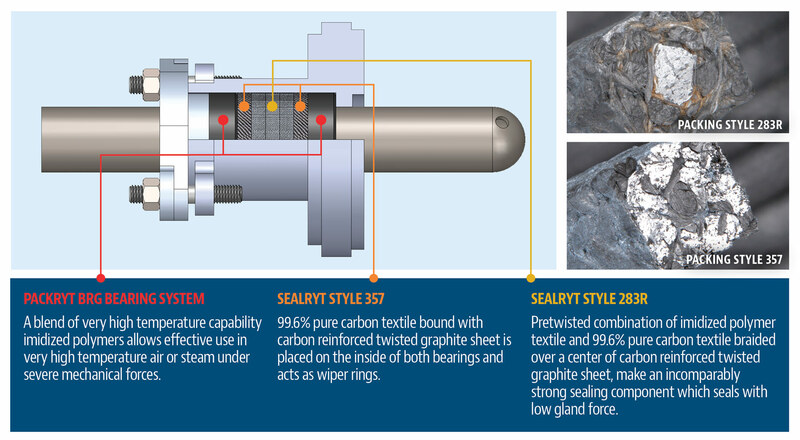 The SteamRyt™ is a long term soot blower sealing solution developed through years of polymeric and textile research. SealRyt's polymer bearing attains exceptional, previously unheard of temperature capabilities and our unique arrangement of one bearing fore, one bearing aft creates a protected cavity for our sealing material. Problem 1. Retract blowers have long overhangs which can cause severe radial/elliptical movement of the shaft in the stuffing box area. Solved! Shaft movement is eliminated with use of two very high strength polymer bearings, one fore, one aft in the stuffing box. Problem 2. Throat bushings become worn from shaft movement and as they wear, packing can be easily extruded through increased clearances. Solved! The use of two close clearance bearings eliminates shaft contact with the throat bushing & prevents inner packing from extruding. Problem 3. Mechanical forces on the packing causes tearing and disfiguration. Solved! Mechanical forces are eliminated in the stuffing box with the use of two close clearance bearings. Packing remains square and works only to seal along the stabilized shaft. Problem 4. Excessive number of packing rings which consolidate rapidly. Solved! The two bearing positions eliminate several former packing positions allowing use of optimal number of sealing rings. Problem 5. Very high air/steam temperature. Solved! All components, both bearings and packing are rated to 800 degrees F or higher.